Keep your child entertained for hours in the car or on a stroller. We passed with flying colors in our certified crash tests. 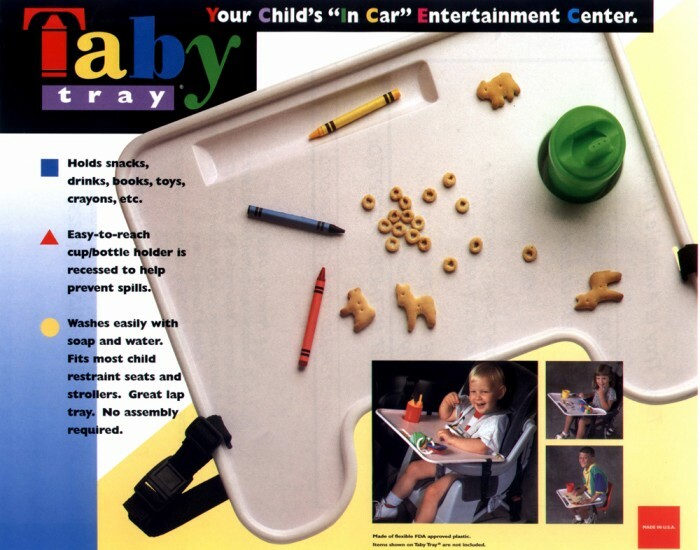 Your child is safe with the TABY Tray. Read more about our product safety. Washes easily with soap and water. Made of flexible FDA approved plastic. I got this tray for my son's daily rides in the car, and it has been terrific! He can eat on it, put his sippy cup into the cup holder, and be totally independent. He can also play on it - cars, crayons, etc., and it holds his books too. We've had this tray for about 9 months, and my now-3-year-old asks for it regularly. We have a Brittax Roundabout, and it works just fine ... snug fit with no tipping. I love the simple design of having a clip on each side, so that if I have to remove the tray completely, the strap underneath doesn't have to be removed. I got this tray for my 4 year old son for a very long car trip. Our son was using the tray for lunch when we were in an accident that totaled our car, and the tray wasn't a problem. We used this tray with a Graco Comfort Sport carseat. How does the tray stay stable? The TABY Tray comes with a strap that is used to secure the tray. The tray works best with something stable to rest on. If the stroller or car seat does not have arms then it will rest on your child’s legs. How does the tray attach to a car seat? 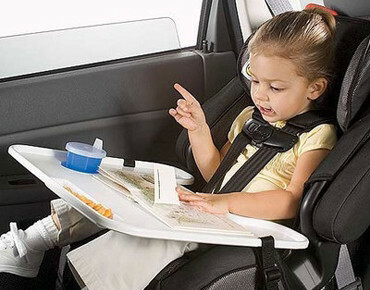 The TABY Tray comes with straps that are connected under the booster/car seat. It helps if the booster / car seat has arm rests to stabilize it. Will the tray work on an airplane? 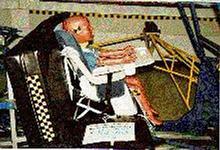 The TABY Tray will work nicely on airplane seats when both armrests are down. The tray will sit on top of the arm rests. What strollers and car seats does the tray work with? 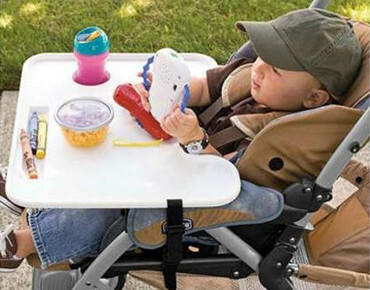 The TABY Tray works with most strollers and car seats. We don’t recommend using it with infant car seats because they are typically tilted too far back. 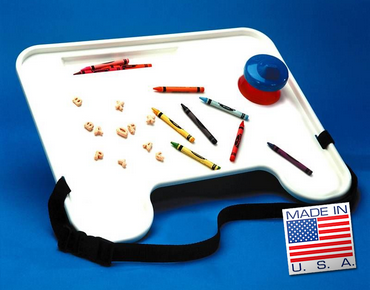 The TABY tray was designed with both function and safety in mind. Functionally, the tray fits a variety of car seats and strollers due to the adjustable nylon web belt and fastening buckles. The tray can be installed conveniently and removed from either side in case of emergency. The plastic material used for the TABY tray is ABS plastic, the same sturdy plastic used for football helmets and other demanding applications. The material is hard, yet flexible and easy to clean. ABS Plastic is not brittle or subject to cracking. ABS plastic will not warp in the heat of an enclosed car. 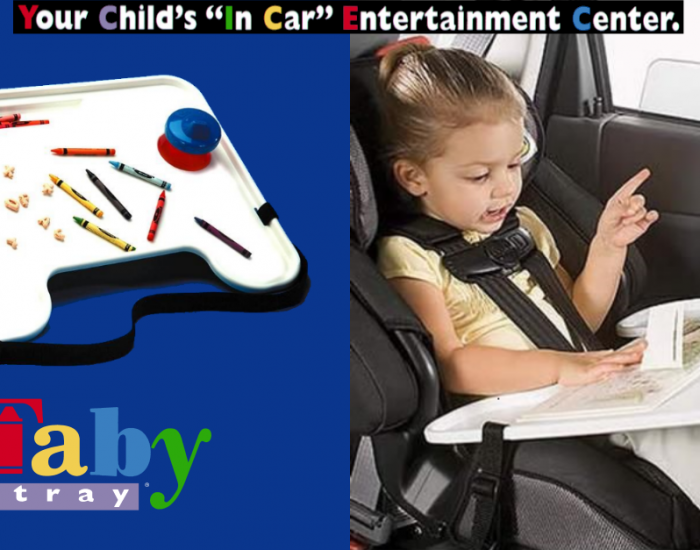 Thousands of children are entertained with the TABY Tray every day. Become a happy parent and get yours today!